Comprehensive Suite of Software for Your Charity...at no charge! The world of local compassion still lives in the 1970s. While all other walks of life are modernized, efficient and socially networked, charities and churches still communicate and manage needs primarily via pen, paper, phone calls and emails. Solutions that could unite and mobilize cities to bring help and hope to those in need have existed in the business world for some time, but they were never brought over to the world of local charity. To solve the problem, a technology vendor would have to invest tremendous dollars and years of time in building systems, only to essentially give it all away. That's not an attractive business proposition. So today, charities continue to struggle to get the word out about their volunteer, resource and family needs to local churches and others who could help. Online newsletters are efficient but ineffective. Yet charities just don't have enough staff to call and email hundreds of local churches and businesses to tell them about their needs. Even if they could, how would a church communicate the vast array of opportunities to serve to its members (year-round)? The pulpit and bulletin don't work. So a significant, sustained move outside the "4 walls" isn't possible. Skills, passions, and valuable resources that could benefit your charity remain trapped in the "pews" because you have no easy way to communicate with them. Meet The Need brings a Fortune 500 caliber solution to the world of local compassion. Now for the first time, through Meet The Need charities can immediately communicate their volunteer and resource needs to a large number of churches, church members, businesses and others in the community who have a heart for the work they're doing. Charities can also manage all volunteers, in-kind donations, families and events…seeing instantly who has agreed to meet each need and watch the remaining needs adjust automatically as they are met (or are partially met). All of those are shared platforms so the needs posted by one charity are instantly shared with other organizations. Yet they're private labeled so they look exactly like your web site – so the community won't see Meet The Need's heart for serving others - they'll see yours. This is huge gamechanger for charities in terms of taking work off your staff, communicating with partners and volunteers, handling logistics, managing and tracking all charitable activities, and mobilizing more people to bring help and hope to those in need. …and despite the 10 years and millions of dollars investing in building all this, Meet The Need is a donation-funded 501c3 so there are no required fees for using any of our software or services. Through Meet The Need, you can create an Amazon.com-type shopping experience on your web site to take volunteer signups and commitments to provide resources. At the same time, members of local churches will see those SAME needs on their church's web site, where they can each sign up to help your charity. Also, when you post new needs, notification emails go out to all those who have expressed an interest in your charity. In just a few minutes, completely organize your charity's next compassion event. No more sign up sheets or spreadsheets. Instead, take registrations for volunteers or items online, and sit back while automatic reminders, updates, cancellations, and reporting take care of the rest. Of course, with Meet The Need, your event needs are also instantly shared with local churches and businesses! Post and accept commitments on your web site for all your items needed. You will see who has agreed to meet each need and watch the remaining number of items adjust automatically (on your web site and all other sites where that need appears) as they are met. Run detailed reports tracking all items provided to your organization over any period of time. Register families to receive items or services on future dates at various distribution sites. Coordinate across all sites to avoid booking the same families multiple times. Print out bar coded confirmations for each family, making check-in a breeze. "We've saved so much money and manage all our programs so easily now…"
"For over 37 years, Metropolitan Ministries has been delivering hope to individuals and families in crisis through services that alleviate suffering, promote dignity, and instill self-sufficiency. The form of that delivery has varied from time to time, but one constant has remained the same—volunteers. Known as the Y factor internally, our volunteer corps has grown steadily during the years and enabled us to deliver hope in greater volumes than ever before. However, during the 2009 holiday season, volunteer contributions reached record highs here at Metropolitan Ministries due in no small part to the technological advances offered by Meet the Need. Early last year, it became clear that tough economic times would bring to our doorstep thousands of more families needing assistance than previous years. In anticipation, we began a partnership with Meet the Need that would eventually enable us to recruit and sign up online almost 1,000 volunteers per day for the week prior to Thanksgiving and the two weeks prior to Christmas. Meet the Need took advantage of society's growing thirst for social media as a means to communicate coupled with our volunteers' busy schedules by providing an easy-to-use calendar, with shift times, of all our holiday volunteer opportunities. Through our web pages, we simply gave volunteers an overview of the holiday volunteer experience and then directed them to an embedded Meet the Need site. With a single click, they could quickly review dozens of opportunities. Just like using an online retailer, volunteers went through the familiar steps of adding shifts to their cart, increasing the number of volunteers to include their family and friends, registering, and checking out. Then within seconds, Meet the Need sent them an automated response providing final details. Moreover, Meet the Need was available 24 hours per day, thus enabling volunteers to sign up at a time of their choosing, regardless of the availability of our staff. Not only did Meet the Need meet the needs of volunteers, but it also met the needs of our staff. Over 2,900 individuals signed up through Meet the Need for 3-hour blocks of time at our Tampa location alone. This provided a savings in manpower of roughly $176,000 (based on the Independent Sector's value of a volunteer hour in 2008 as being $20.25). Moreover, the saving extended into our own personnel costs. Not only did we save over 290 hours of time spent on the telephone signing up volunteers, but Meet the Need's professional and responsive support team provided immediate, customizable solutions to our needs through the season. Consequently, our already stretched (yet charming) volunteer staff was then freed up to address other critical needs. In the end, however, Meet the Need's greatest value came in the form of linking vital community resources with real people to meet the needs of those hurting and in despair. By the end of the holiday season, over 37,000 families across three counties were helped with the aid of Meet the Need. Today, Metropolitan Ministries continues to use Meet the Need, but in three new ways: to solicit specific assistance on behalf of our resident families, to organize year-round food and toy drives, and to attract "high impact" (i.e., long-term) volunteers. Hope continues to live at Metropolitan Ministries each and every day in part because of the generous contributions of volunteers throughout the community. It is a win-win situation for all involved and only made possible through strong and lasting partners like Meet the Need. Thank you Meet the Need for helping make that happen!" How does this integrate with our website? Meet The Need is the system behind your "Volunteer", Most Needed Items" and "Help a Family in Need" buttons. There is no software to load and no IT people needed. Simply attach links provided by Meet The Need to buttons on your site and all of our functionality is at your disposal, including instant sharing of needs you post. How do other organizations instantly see our needs? Meet The Need also powers the "Serve the Community" button for local churches and businesses. When members or employees click those buttons, they see a list of local needs and can "shop" based on their skills, interests or items in their garage. Your partner organizations may even highlight your charity and provide a dedicated button directing people to view and meet your needs. If there's no charge, how can it all be state-of-the-art software? Our mission as a Christian non-profit is to mobilize people to bring hope and help to those in need. 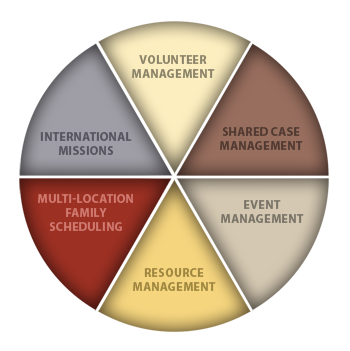 Our collaborative model works best when many organizations in a community are using Meet The Need. Offering software at no charge is not enough to convince most charities to come on board. Our 5 modules have to be best-practice and easy to use, which is why many of the largest churches and ministry organizations in the country now use Meet The Need. What type of reporting do we get through Meet The Need? You will see everything that everyone who is involved with your organization has done to serve. You'll also be able to create and view item reports, demographics, volunteer hours, bar charts, pie charts, etc. giving you all the information you need about your special events, year-round activities, and family assistance. This page loaded in 0.00389 seconds.